September Mourning is a really interesting band, and I use that word "band" loosely since according to them they are actually reapers sent from Mortem, their "home plane of existence". Hey buy into it people, it's all in good fun. If you're part of the comic book world, then these guys are right up your alley. The concept behind this unit comes courtesy of vocalist/founder Emily Lazar who wanted to blend her love of comics with music. A partnership with Marc Silvestri has yielded a trans-media project that fairly crackles with energy from the music to the live presentation to the comic book. So September Mourning was created with the idea of a fictional idea brought to life both on page and the stage. 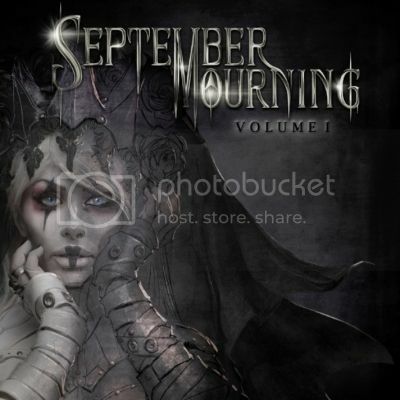 According to an interview I did with September earlier this year, "September Mourning started as a conceptual storyline about the character September Mourning (ed: Lazar), who is a human-reaper hybrid. She feels the need to give some human souls a second chance, and thus toys with Fate. Reapers are made by Fate with a very specific job… clean up the mortal realm of souls that are meant to pass on. Because September is a human-reaper hybrid she has empathy which none of the other reapers possess. The other reapers are sent by Fate to stop September from giving souls second chances. The musical side developed over a few years after the storyline was completely formed." 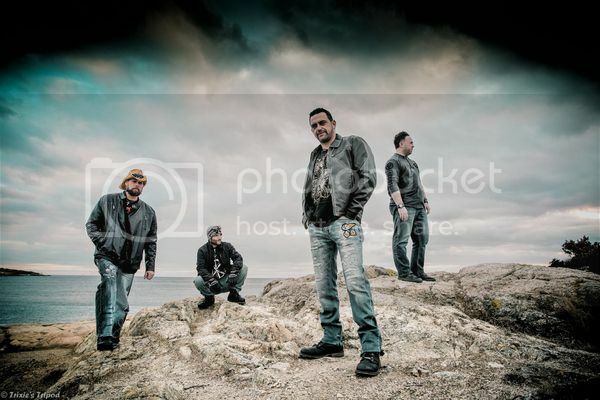 The band initially tested the waters several years ago with two previous records, honing their craft and laying the groundwork for what was to come. And what was to come is their new EP, Volume 1. If the definition of a great record is something that you can literally play repeatedly and not tire of, then I guess I can safely consider Volume 1 a great record. September Mourning is a hard rock band with slivers of electronic flavouring, infusing their songs with a terrifically strong melodic bent and razor-sharp production (courtesy of Sahaj Ticotin from RA). The EP is only six songs deep but all of them make an impact on your ears, each retaining their own identity without being cookie-cutter clones of each other. The two things that immediately struck me about this record are the afore-mentioned songs and the absolutely riveting voice of September. Man, this girl can sing! From the first note to the last, I was listening to each and every syllable, soaking them up like the first drink after crossing the Sahara Desert. Her natural singing voice is magnetic but she can also occasionally break off into a growl that avoids Angela Gossow territory and goes for something wholly appropriate to the song ---- not guttural but malevolent in a melodic yet chaotic sense. The band, guitarists Riven (Rich Juzwick), & Wraith (Kyle Ort), bassist Shadou (Jeriah Eager) and drummer Stitch (Josh Fresia) bring each song to life with an organic feel that is as powerful as it is perfunctory. "The Collection" beckons you in to the record with an intriguing intro that is both nightmare-ish lullaby and a call to arms for reapers world- (and other-wise) wide. Commanding and entrancing, this track could have been fleshed out for another few minutes because it definitely can peak the interest to those who are interested. 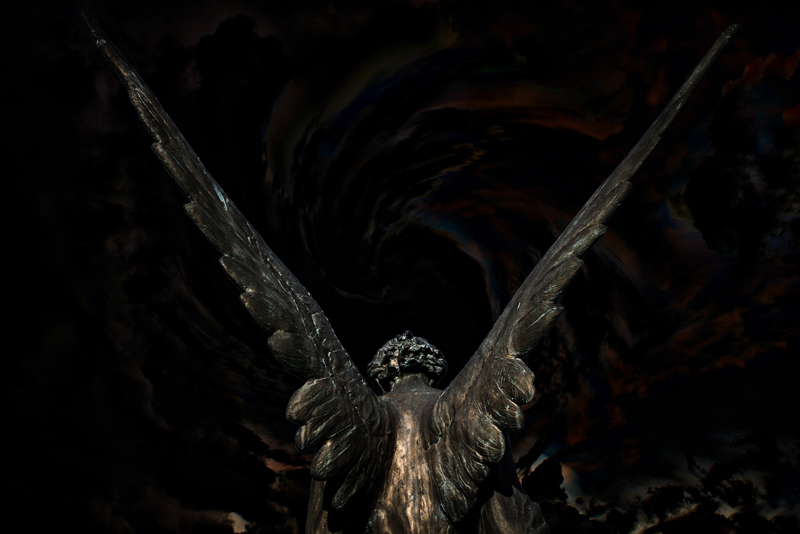 "Angels to Dust" comes hot on the heels of the previous track and instantly displays the voice of September as a siren of the highest order. Crunchy, but punctuated by an electronic skeleton, this track is punchy yet aerated enough to allow September to take centre stage and grabs your ears with her urgent, yet seductive voice. I say possibly because the next track, "Children of Fate" refuses to take a back seat to anybody. Borderline symphonic trappings only serve to augment this spectacular song. Melodic, relentless and dynamic, we are treated to the full scope of September Mourning's powers. In a word....wow! "Eye of the Storm" reminds me of some of the European power metal bands such as The Murder of My Sweet. Crunchy and bombastic (in a good way)...I likey. The record closes with a very odd cover. Here the band takes on the pop classic "Stand By Me" by Ben E. King. When I first heard about it, I thought "why on earth would they do such a thing?" Then I heard it and while the first listen did not convert me, I quickly got on board after several spins and now I think it's a really cool idea. The verses are fairly by the book (albeit more darkly) but the choruses thump the heck out of the original and towards the end, September gets into wailing mode and takes the song to a different place. Big points for trying something different. And there you have it, without overstaying their welcome, September Mourning has introduced themselves to the world at large with a magnificent effort. I can only imagine how awesome this band is live and their mindset lends itself to a live setting like hand in glove. By far, this is one of my favourite records of 2015!! !